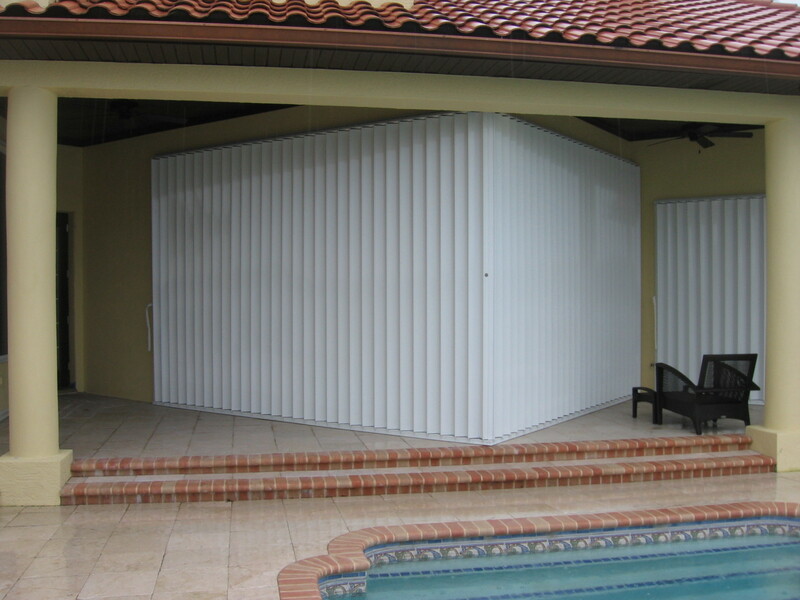 Accordion Shutters are permanently installed for year round protection. They fold back compactly similar to a louvered door and are one or two piece shutters. They are installed in front windows and doors, balconies, and large patio openings. Accordion Shutters are convenient, and easy to close. 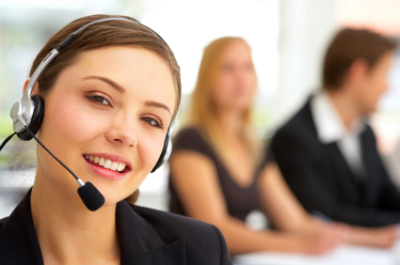 They lock from the inside or outside for increased security and protection. Accordion Shutters are made of aluminum and should be cleaned and lubricated yearly. 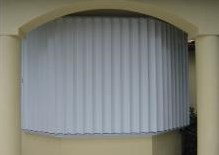 Accordion Shutters are considered one of the strongest shutters available. A Special 90° Corner Mate is available to exactly fit your balcony and not take up valuable floor space. The new Big Bertha HV features Protection for residential and commercial applications. 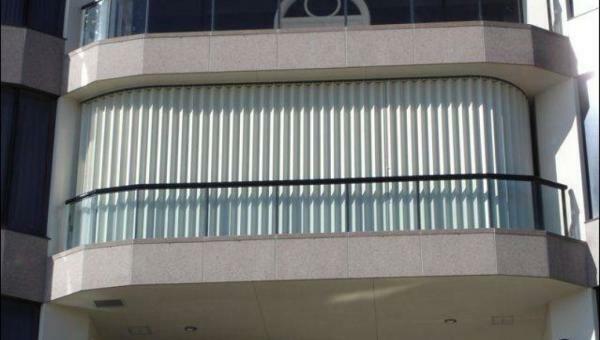 The two-blade system is highly versatile and allows flexible use of components for both commercial and residential High Wind / Hurricane Shutter Systems. The Vertical Interlocking Blade system gives stability and strength even in the worst possible weather conditions. Each Blade interlocks into the next with a sure locking design and are made from Heavy Duty Extruded Aluminum. All hardware is Xylan coated to prevent rust and oxidation. Each AccordionShutter is made with Engineered Wheel Carriage assemblies in the top. These wheel carriages utilize silicone impregnated wheels for easy gliding within the top mounted extruded aluminum tracks. This makes even very large shutters easy to open and close. The Accordion Shutter system also comes with a 5-point locking system that gives maximum security to the covered opening. The key lock uses a special numbered key unique to each shutter. Vertical Locking pins are also engaged into the tracks for security and rigidity when the shutter is completely closed. Accordion Shutter can be custom tailored to you needs. We offer Window Lites that allow light through the shutter and Mechanically Bent Tracks for odd shaped balconies. 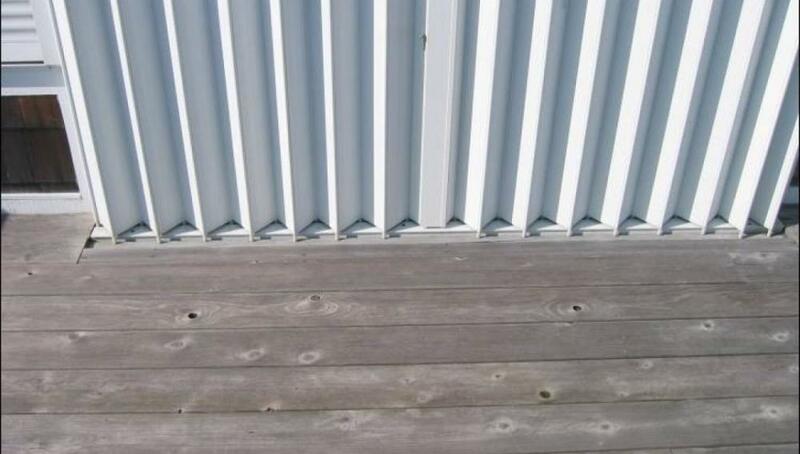 The Bent tracks allow the shutters to better fit your balcony layout to maximize valuable deck space or can be used to cover Bay style windows.